Blood bags candy. Bags of candy blood is the perfect Halloween candy. 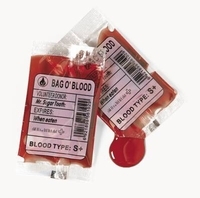 Each Mini blood bag has a strawberry liquid that looks just like real blood. These are definitely a gross Halloween Candy. Each bag has 5oz and approx 2 7/8" x 2 1/8". Candy blood bags are perfect if you are looking for Halloween candy for your party. You can also add them to your vampire Halloween Costume. If you are planning on doing Halloween baking just drizzle a bit of this candy blood on your treats to make them look very realistic. You get 12 mini candy blood bags per package.